Macclesfield Town moved nine points clear at the top of the National League with a 1-0 over a much improved Chester. 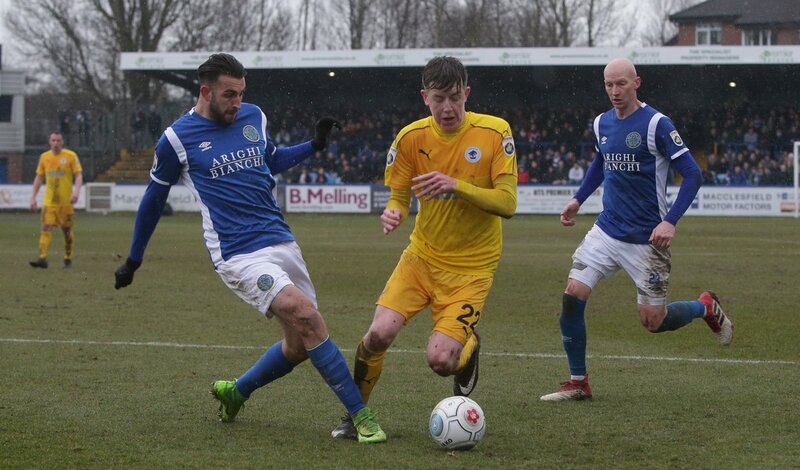 Danny Whitehead scored the only goal for the Silkmen midway through the second half, but despite numerous chances throughout the game, the Blues could not find a breakthrough. Marcus Bignot only made two changes to the Blues side who fell to a 2-0 defeat against Torquay United on Good Friday. Myles Anderson and Tom Crawford entered to starting eleven in the place of Lathaniel Rowe-Turner and the suspended Lucas Dawson. The visitors seemed to look impressive in the opening minutes of the encounter, and Harry White gave the travelling supporters cause for optimism. The 23-year-old tested Shwan Jalal from the edge of the penalty area with two low drives at goal, but the former-Wrexham man was equal to both of the striker’s efforts. John Askey’s side were not short of a few chances themselves, however. Tricky winger Mitch Hancox made the most of his athleticism to fire a low ball across the face of goal, which evaded Tyrone Marsh and was cleared away from any further danger. David Fitzpatrick ventured forwards to direct his rasping strike well over Andy Firth’s crossbar, before Keith Lowe almost claimed a clean connection on a cross, but the centre-half saw his effort drag marginally wide of goal. But Chester continued to find themselves on top in regard to opportunities in front of goal. Gary Roberts whipped in a corner destined for the head of captain Ryan Astles, and from the resulting flick on, James Akintunde guided the ball narrowly over the cross bar after a late run towards the back post. White proved himself to be the Blues’ main man to watch in the opening half and went close to getting the better of Jalal on the half hour mark. Returning to his former charges, Andy Halls flicked the ball delightfully into the pass of White, and after finding some space dragged his strike wide of Jalal’s right-hand post. After a spell of early pressure in the second half, Macclesfield took the lead through Whitehead. Hancox caused the Blues problems on the left flank yet again and found the Silkmen midfielder in space just inside the area. Unchallenged and unmarked, Whitehead guided his low strike beyond a despairing Firth between the sticks for the Blues. Jalal pulled off an outstanding save on the hour mark to deny youth graduate James Jones his first senior goal. White fired his 25-yard free kick into the wall, and the 18-year old centre back brought the ball down, only for the Silkmen stopper to tip his effort over the crossbar. Despite the home side’s dominance on the ball in the second period, the Blues began to look good moving the ball forwards in their search for a leveller. Halls won the flick on yet again for team mate White, and after turning well in the box, struck his half volley directly at Jalal. Chester looked to be denied a penalty by referee Thomas Bramall as the game drew to a conclusion. Substitute Kieran Kennedy tripped Crawford in the area, but the south Yorkshire-based official waved away the protests. Chester: Firth, Hobson, Jones, Astles, Anderson, Halls, Roberts, Crawford, Mahon, Akintunde (Archer 74), White. Unused subs: Jaaskelainen, Vose, Cunningham, Downes.